As revealed today at HitFix and Nerdist, Superman and Wonder Woman will be getting new costumes after Covergence, the publishing event that heralds the next editorial reconfiguration of the DC Universe. While costume changes are a familiar element of long-running superhero characters, each re-design speaks to various traits that the companies and creators are trying to emphasize. 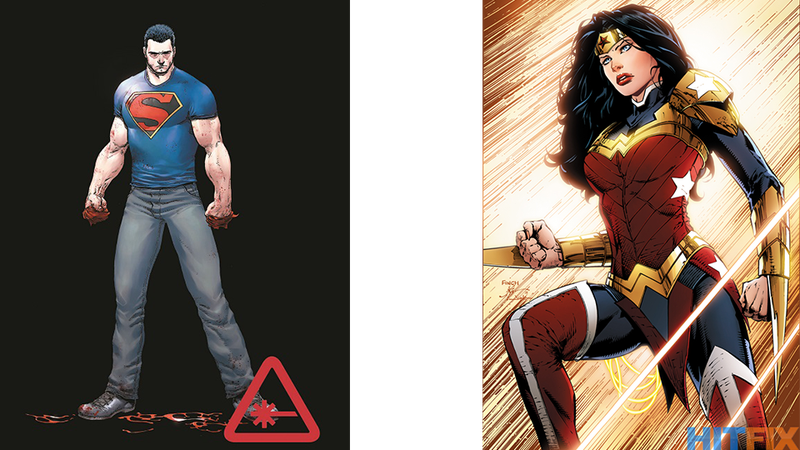 So, here, it’s telling that Wonder Woman’s showing far less skin than she generally does in her most familiar looks. In the past, there’ve been a whole bunch of variations on Wonder Woman’s semi-patriotic theme, but this is a pretty radical departure that covers her up a lot more. Wonder Woman’s legwear has been the source of controversy before, most recently when her New 52 costume went from having pants to pantsless. The upcoming armor also seems more in line with her new status as the God of War in DC’s greco-roman pantheon and its blades hint at a potentially more violent characterization for Diana. Superman looks like he’s getting tougher, too, with a close-cropped haircut and a t-shirt-and-jeans outfit that recalls what Clark Kent wore in the Grant Morrison-written New 52 reboot. The coloring on the S-shield harkens back to the character’s Golden Age iteration, which was a time when Superman was a crusading strongman determined to fix society’s problems. The most significant change, of course, is the lack of any sort of cape. This return to an everyman Kal-El could be a sign of a whole new tone for DC’s flagship character.